Dholai River is originated from the Cherapunji Hills (চেরাপুঞ্জি পাহাড়) of India and entered the country through the Bholagonj of Sylhet. After flowing very poorly in our country, it joined with the River Surma. 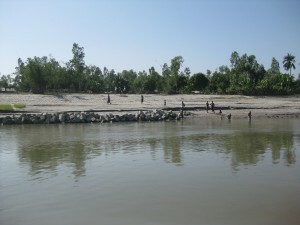 Dholai River (ধলাই নদী) is famous for the stones. People used to collect the stone from the river. 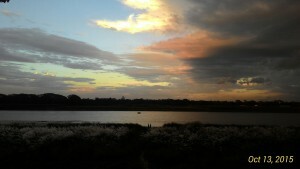 I have walked at the bank of the river from Bholagonj to “dosh number point”. The river bank seems too high for me. 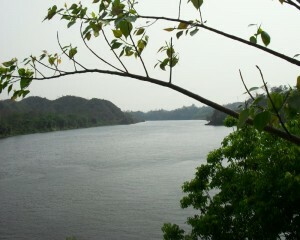 Possibly during rainy season, the river may have lot of water with heavy current. After reaching Sylhet, take local transport to reach that place which is located in Companyganj. Three type of transportation mode is available towards Sylhet from Dhaka. You can get in there by bus, train or air. Bangladesh Biman, NovoAir, United Airways and Regent Airways are the four operators who fly from Dhaka to sylhet. The ticket price starts from 3000 taka & it goes up to 8000 taka per pax. There are more than 10 flights every day from morning to evening. There are four train services from Dhaka to sylhet. They are Joyontika, Parabat and Upoban depart at morning, noon and evening. There is a new train named Kalini depart at afternoon from Dhaka. It takes 7-8 hours to reach sylhet.The ticket price is around 295 for shovon-chair & it gets 679 taka for 1st class AC. Departure time from Sylhet-10:00PM, arrival time at Dhaka-5:30AM. Departure time from Sylhet-08:20AM, arrival time at Dhaka-4:00PM. Fair of all these ranges according to compartments usually BDT 75-1018. 1. Hotel Eastern Gate & Panahar Restaurant. 4. Greenland Hotel & Restaurant. 5. Hotel City Link International. 6. Surma Valley Rest House. You can go for a boat trip and take photos of this beautiful river. Sariakandi Upazila (Bengali: সারিয়াকান্দি উপজেলা) is an upazila of Bogra District in the Division of Rajshahi, Bangladesh. Sariakandi Thana was established in 1886 and was converted into an upazila in 1983. It is named after its administrative center, the town of Sariakandi. In Bangladesh, the Brahmaputra (ব্রহ্মপুত্র) river is joined by the Teesta (তিস্তা) river (or Tista), one of its largest tributaries. 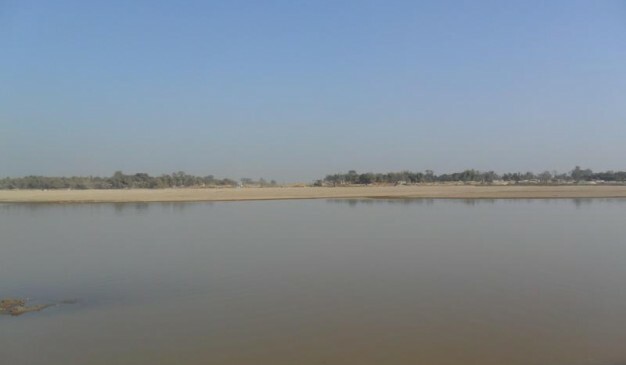 Below the Tista, the Brahmaputra splits into two distributary branches. 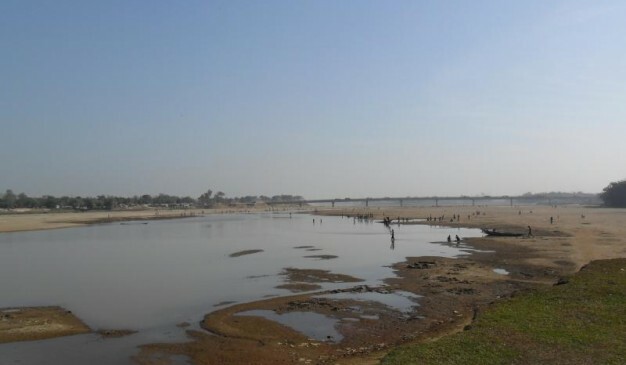 The western branch, which contains the majority of the river's flow, continues due south as the Jamuna to merge with the lower Ganges called as Padma river. The eastern branch formerly the larger, but now much smaller is called the lower or old Brahmaputra. Mymensingh (ময়মনসিংহ) district stands just beside the old Brahmaputra river. It curves southeast to join the Meghna River near Dhaka. The Padma and Meghna converge near Chandpur and flow out into the Bay of Bengal. 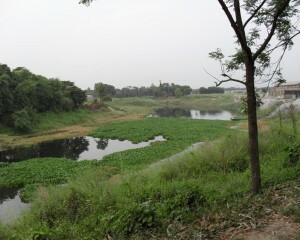 This final part of the river is called Meghna. The Brahmaputra enters the plains of Bangladesh after turning south around the Garo Hills below Dhuburi, India. 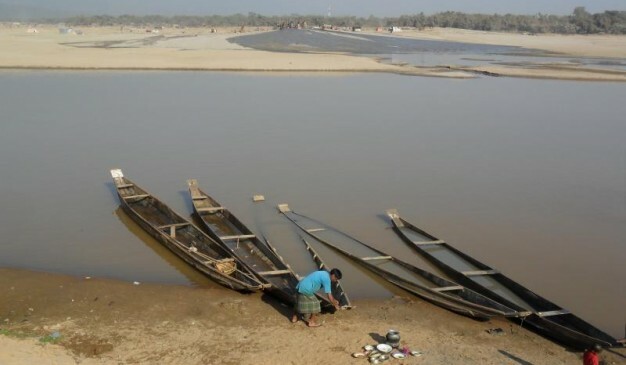 After flowing past Chilmari, Bangladesh, it is joined on its right bank by the Tista river and then follows a 150 miles (240km) course due south as the Jamuna river. 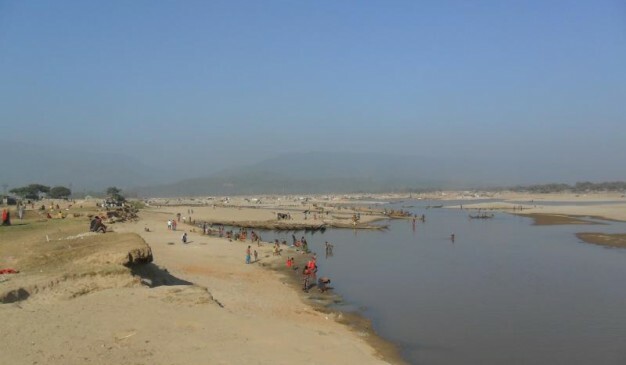 South of Gaibandha, the Old Brahmaputra leaves the left bank of the main stream and flows past Jamalpur and Mymensingh to join the Meghna river at Bhairab Bazar. There are lot of bridges over this river at several districts. Near the Mymensingh town, you'll find two bridges. One is for the road transports, and other one is only for railway service. From one bridge other one can be seen and a traveler can enjoy the whole view of river while walking through a passage just beside the river.